Nha Trang (Vietnam), October 23, 2017 - Confirmation of the heady winning streak for the Cookson 50 Mascalzone Latino, flying the colours of the Yacht Club de Monaco. After winning the world title on a difficult course off Trieste in the fiercely competitive and experienced ORC fleet, Vincenzo Onorato’s crew today celebrates its first place overall in the IRC fleet in the South China Sea in the Volvo Hong Kong to Vietnam. It was the first time the Mascalzoni had raced in such distant waters in such a hot climate: the heat and humidity made the race a real undertaking. Fortunately, winds were favourable and in the end the race proved an enjoyable adventure. After leaving the beauty of Hong Kong, the route towards Hainan, a recent paradise for Chinese yachting and luxury, gave the idea of a pleasing conquest. With the wind always abaft the beam, halfway between Sanya and the prohibited area of the Paracel Islands (contended between China and Taiwan for their natural riches), the bow of the Cookson 50 then headed south for the central southern coasts of Vietnam, finishing in Nha Trang, an increasingly well-known “resort city” surrounded by bays with fine white beaches. 40 years from the end of one of the worst conflicts of the 20th century, many traces remain but reconstruction is also well underway with the development of the tourist zone, where a new construction also houses the headquarters of the club which tomorrow will reward the Mascalzoni in front of the rest of the fleet of 13 mostly Chinese yachts. The history of this race of more than 800 miles, sailed in two days, five hours, 26 minutes and 31 seconds by the Mascalzoni, about three hours longer than Alive (winner of the 2015 edition and first in real time but third overall), is written above all in the comparison with a similar yacht. On the podium were also Freefire (a TP52) and Alive (a Reichel/Pugh 66), but Mascalzone Latino stood out above all over the fourth placed Ubox, another Cookson 50 that arrived 11 hours and 20 minutes behind. It was a great result, with a lead of more than 120 miles at the finish although the adversary was no novice: the same crew finished the 2016 Rolex Sydney Hobart third place among the IRC and overall first among the ORC. An important result that could further boost the morale of the Mascalzoni on the eve of the next and inevitably final appointment of this very long season: the Rolex Sydney Hobart. Here are the crew members who took part in the Volvo Hong Kong to Vietnam. In the cockpit: Vincenzo Onorato, Adrian Stead, Ian Moore, Lorenzo Bressani, Flavio Favini, Leonardo Chiarugi, Matteo Savelli, Gaetano Figlia di Granara, Stefano Ciampalini, Pietro Manunta, Davide Scarpa and Justin Clougher. Adrian Stead (GBR), Mascalzone Latino’s afterguard: “Our race started with a tricky beat out of Hong Kong harbour having a good battle with the 66 foot Alive. Once clear of the mainland we were onto the spinnakers and sailed over 95% of the race with either full size masthead spinnakers or fractional set. How was it? Fun, wet both on deck and below. Lots of darkness with no moon. Great waves and fishing boats to avoid! Top speed - somewhere around 28 knots but not sure as the speedo was out of the water a few times! 5-6 knots of current sometimes ripping along the Vietnamese coast. Warm water so every wave felt like a shower. This race was a great warm up for our team for the December Rolex Sydney to Hobart race. We learnt a lot of things about the boat, its performance and how we worked together as a team. The guys did a great job and very proud to win another offshore classic race with Mascalzone Latino”. 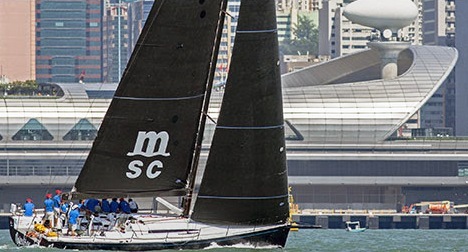 Ian Moore (GBR), Mascalzone Latino’s navigator said: “The Volvo Hong Kong Vietnam race really lived up to its reputation as an exciting and challenging downwind thriller. The start is amazing with the background of sky scrapers but the real challenges were waiting for us outside. The North East Monsoon was in full flow and quickly brought us winds of 20-30 knots. It can be easy in these conditions to push too hard and break gear or sails early but we did a good job of managing our assets through the first night and then pushing really hard on the second day and second night. It was a tough race as a navigator, trying to find the expected wind shifts and make the most of the strong current that runs along the Vietnam coastline.I was lucky enough to do the race 4 years ago but it was fantastic to return with Vincenzo and the Mascalzone Latino team”.